Wealth management (WM) is a financial service that incorporates financial planning, investment advice, portfolio management, accounting/tax services, and a number of aggregated financial services. In other words, WM is more than just an investment advisory service because it covers all of the financial activities of an individual person. As more and more financial institutions begin to offer WM services, the competition for customers has turned very fierce. Although understanding and coping with customers’ needs can be critical for financial institutions, sparse research has been devoted to weighting customers’ decision criteria, despite the extensive literature on WM. The reputation of WM services was severely impaired after the financial crisis of 2008, especially due to the bankruptcy of Lehman Brothers, which sold structured notes through financial firms to investors who lost much of their wealth. Identifying those factors that potential customers perceive to be relatively important in their WM selection process is particularly urgent when the business of WM services has shrunk substantially. This study may lead to a better understanding of the following questions: Do the priority weights of investors present a different pattern after the financial crisis of 2008? Do WM service providers meet the needs of their targeted clients? This article adopts the same criteria and subcriteria for the selection of WM services used by Yu and Ting . The work by Yu and Ting  only collected information from investor perspectives, and their survey was conducted between July and September 2008. This article, however, investigates both investors and financial advisors and therefore is able to examine the gaps in recognition of WM services between investors and advisors. The questionnaires were also collected four years later than the study by Yu and Ting , letting us analyze the differences over time among the influential factors in the selection of WM services. This article surveyed the relative importance of factors related to WM, including image, products, and quality of service, by directing questionnaires to both investors and financial advisors. Each factor consists of four or five subcriteria. 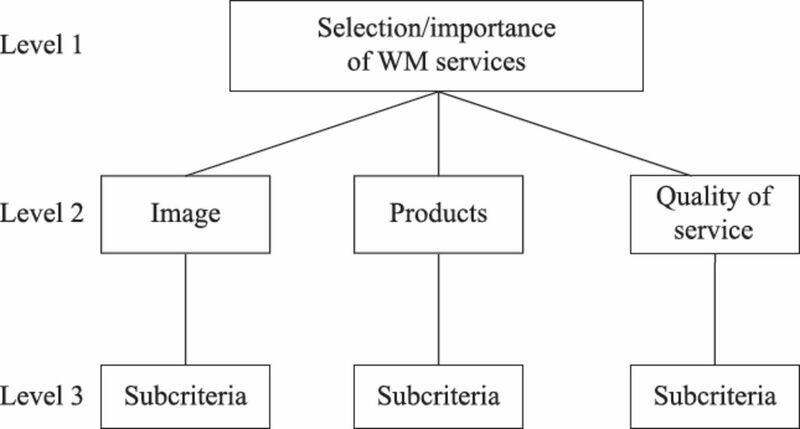 Using the analytical hierarchy process (AHP) method, this article shows that general investors’ first concern about WM services is the products, followed by the quality of service and image, except for those investors who have received a high-school degree or less education, who regard image as the most important factor. Yu and Ting  found that investors’ first concern in 2008 about the WM service is the quality of service, followed by products and image. Compared with the results of this article, Yu and Ting  showed that investors have changed their priorities after the recent global financial crisis. This article also finds that financial advisors generally emphasize the quality of service as the most important factor when they provide WM services, suggesting that financial firms have not caught up with the changing pattern of investors’ priorities. The remainder of the article is structured as follows. The second section, “Literature Review,” briefly reviews the existing literature on issues related to the selection of financial services and applications of the AHP method. “Data Collection and Methodology” details data collection and methodology. “Results” discusses the key factors affecting consumers’ choice of WM services, the importance of WM services emphasized by the advisors, and comparisons of the top-three investments. The last section concludes the article. WM provides high-net-worth individuals and families with comprehensive financial services, including investment portfolio management, asset management, estate planning, legal resources, and so on with the aim of sustaining and growing the long-term wealth of clients. The financial crisis in 2008 damaged the image and businesses of financial corporations, bringing forth doubts about the value of complex financial instruments. Thus, understanding the key factors that influence consumers’ choice of financial service has become a critical issue in attracting consumers to adopt WM services. Because the average consumer cannot differentiate between one intermediary and another (Boyd, Leonard, and White ), the competition for customers has become quite fierce. Therefore, financial institutions must be cognizant of customers’ needs and desires (Graddy and Spencer ). Previous studies have revealed that recommendations are a common decision criterion in the selection of banks (Martenson ; Tan and Chua ; Zineldin ). Tan and Chua  suggested that recommendations from others are one of the strongest influential factors. Shah and Siddiqui  used a case study to investigate critical organizational success factors in e-banking adoption at the Woolwich bank. They noted that the most critical factors for success in e-banking include understanding of customers, organizational flexibility, availability of resources, system security, an established brand name, having multiple integrated channels, e-channel–specific marketing, system integration, systematic change management, support from top management, and good customer service. Gerrard and Cunningham  noted that the provision of fast and efficient service and confidentiality are most influential components. Stafford  indicated that customers demand courtesy, friendliness, and convenience. Khazeh and Decker  suggested that reputation (positioning) is one of the most important factors in the bank selection decision. Ishizaka and Nguyen  also emphasized the importance of services in bank account selections, including personal service quality, banking service features, and building quality. Boyd, Leonard, and White  suggested that reputation, interest charged on loans, and interest on savings accounts are more important criteria, whereas other criteria, such as friendliness of employees, modern facilities, and drive-in service, are less important. Kaynak and Kucukemiroglu  studied the importance of various criteria in the commercial bank selection decision and found that the most important considerations are fast and efficient service and friendliness, followed by banking transaction efficiency and convenience. 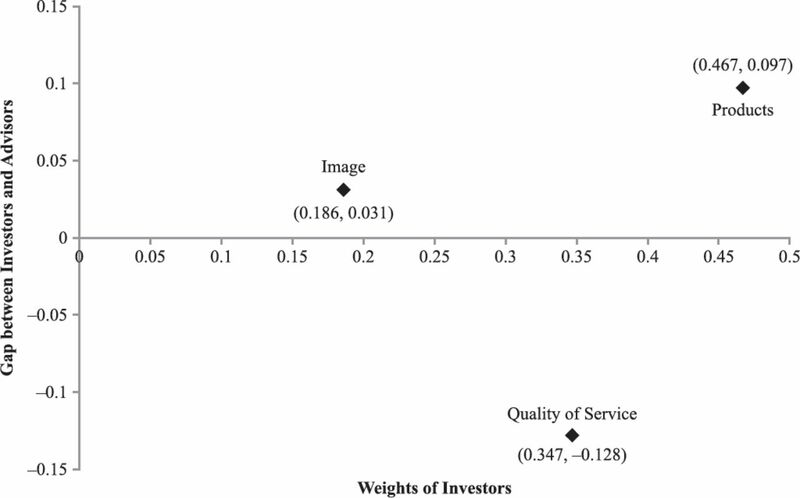 Liang and Wang  also noted a positive relationship between service quality satisfaction and perceived relationship investment, with their study emphasizing the importance of the quality of services. Huang and Lin  developed a personalization framework for financial services and suggested that financial firms should transform the content of relevance from product–process dimensions to cost–benefit dimensions. For customers to weigh benefits over costs, financial services should raise the level of service sophistication by keeping the promise of personal privacy, improving the accuracy and relevance of personalization results, and providing a convenient feedback channel that empowers customers by granting them full control over the accuracy of their personal information. Following the previous literature, this article considers three dimensions of factors that affect customers’ choice of WM: image, products, and quality of service. Each criterion includes four to five subcriteria to profile the dimension. Exhibit 1 summarizes the criteria and subcriteria. The priority of the criteria could vary with investors’ and advisors’ characteristics. Therefore, the analysis considers several characteristics (including gender, financial background, educational background, investor attributes, and years of work experience) of investors and advisors. Saaty [1977, 1980] developed AHP as a decision-making technique that can cope with both the rational and the intuitive in selecting the best option with respect to multiple criteria (Saaty and Vargas ). AHP can be applied to solve a wide variety of multicriteria decision problems, including evaluation of alternatives, resource allocation, planning and development, prioritization and ranking, forecasting, and performance benchmarking (Vaidya and Kumar ; Zahedi ). AHP has therefore been adopted by many organizations in various sectors, such as industrial, government, political, engineering, and management. The literature does include some applications of AHP in the banking sector, such as relocation of bank logistics facilities (Opasanon and Lertsanti ), current bank account selection (Ishizaka and Nguyen ), customer satisfaction in the Turkish banking sector (Dincer and Hacioglu ), performance of WM banks (Wu, Lin, and Tsai [2010, 2011]), bank performance evaluation (Stankeviciene and Mencaite ), assessment of bank branches based on customer satisfaction (Momeni et al. ), assessment of personnel productivity in a large private bank (Azadeh et al. ), WM service selections (Yu and Ting ), evaluation of emerging industry credit ability for the banking sector (Lin and Chen ), rating of factors that influence e-banking development in Iran (Haghighi, Divandari, and Keimasi ), bank loan decisions (Che, Wang, and Chuang ), and merger strategies for commercial banks (Wang and Lin [2009a, 2009b]). This article extends the work of Yu and Ting . This study proposes using the AHP method to rank those factors that affect consumers’ choice of WM services and the importance of WM services emphasized by financial advisors. In this way, this article is able to compare the priorities from investors’ and financial advisors’ perspectives. The gap between them provides useful information for financial firms. Two hundred and seventy-three questionnaires were distributed over four cities/counties (Taipei, Hsinchu, Kaohsiung, and Pingtung) in Taiwan between November and December 2012. Using convenience sampling, we received 137 usable questionnaires from investors and 111 usable questionnaires from financial advisors. Because we waited for participants to complete the questionnaires, the response rates (75.27% and 81.62%, respectively) are relatively high. Panels A and B in Exhibit 2 display the sample distributions of investors and financial advisors, respectively. Among all investor respondents, 71% are female and 35% are 30 to 40 or 40 to 50 years old. Among all financial advisor respondents, 64% are female, and 41% are 30 to 40 years old. The investors and financial advisors have some similar characteristics. Most respondents have received a college degree or higher: 88% of investors and 94% of financial advisors. Investors with a financial background might develop a special personal investment philosophy that could result in considerations in their choice of WM services that differ from the considerations of those without any financial background. Therefore, the question of whether the respondent has a financial background (educational background or work experience) is included in the questionnaire. Around 74% of investors have finance- or economics-related educational degrees or have worked in a finance-related field. Similar to the sample of investors, 74% of financial advisors have finance- or economics-related educational degrees. The annual income and investment amounts of investors are overall not high. About 94% of the investors have an annual income of less than NT$1 million.3 Excluding their primary residence, only 27% of investors invest more than NT$1 million. The investment amounts of financial advisors are higher than the investment amounts of investors; around 41% of the former invest more than NT$1 million. Most financial advisors (48%) have been working in their field for over 10 years. This article adopts the AHP method for ranking those factors that affect consumers’ choice of WM services and the importance of WM services emphasized by financial advisors. There are three steps in applying the AHP method. First, the decision problem is decomposed into a hierarchy of criteria. Second, the input data related to each criterion are generated by pairwise comparisons of the criteria using a nine-point weighting scale, which is the standard rating system used in AHP. Finally, the eigenvalue method calculates the weight of each criterion in each level of the hierarchy (Yingzi, Goedegebuure, and Van der Heijden ). Saaty and Vargas  provided a more in-depth and updated discussion of the AHP methodology. Exhibit 3 shows the hierarchy map of the decision-making problem. At the top of the hierarchy is the general objective of the decision problem (i.e., the selection/importance of WM services). Level 2 shows the three main criteria that may influence investors’ choice of WM services or that are emphasized by financial advisors: image, products, and quality of service. The attributes associated with the level 2 criteria are listed under the relevant criterion as the level 3 subcriteria. 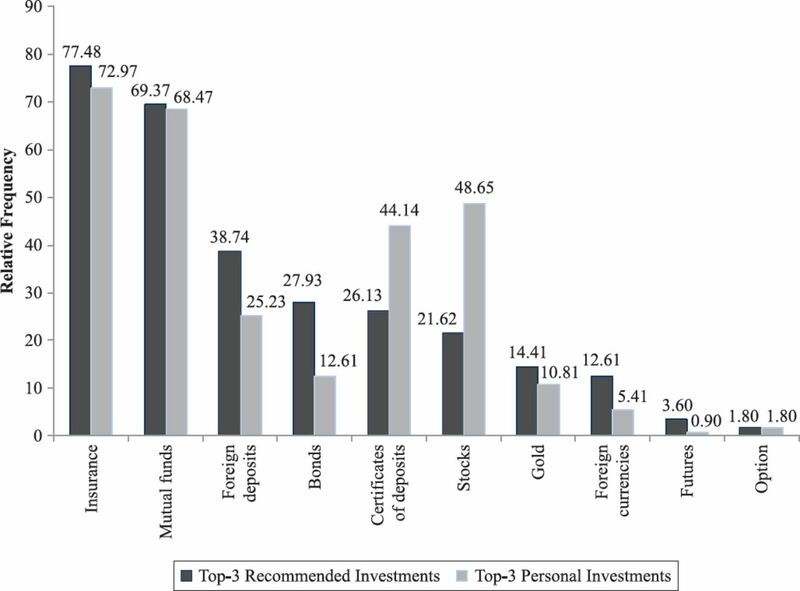 Considering that investor attributes may influence the priorities of the criteria, this article classifies the subjects’ investor attributes in four dimensions: risk-taking, returns, product-familiarity, and investing habit. These attributes are established by 14 questions using a five-point Likert scale. Factor analysis is adopted as an exploratory tool to classify respondents into groups with similar investing characteristics and habits, whereas exploratory factor analysis is commonly used to uncover the underlying structure of a relatively large set of variables. According to the research analysis, the respondents are classified into three attribute groups: moderate, conservative, and active investors. Exhibit 4 displays the results of one-way analysis of variance (ANOVA), confirming the classification adopted in this study to be appropriate. Among the 137 respondents, 17 have received WM services after the recent global financial crisis. Exhibit 5 shows their perspectives on WM services after the crisis. Although the sample is small, it still gives some insight into investors’ perspectives, especially after the postcrisis negative impact on WM services. The respondents were asked eight questions using a five-point Likert scale, and no respondent strongly agreed with the questions. The percentages of each scale are displayed in the exhibit. More than half of the respondents (53%) do not think WM services would help them lose less wealth, and 83% would not scrutinize the investment products that financial advisors recommend. The reputation and the business of WM services slumped after the financial crisis, especially for those financial firms that sold structured notes issued by Lehman Brothers. Around 83% of investors think the quality of service has not improved, and 77% think the products are not diversified. Moreover, more than half of the investors think that the image and professional aspects of WM services were impaired. Overall, fewer than 18% of investors believe WM provides better quality of service, diversified products, image, professionalism, morality, and reliability after the financial crisis. Exhibit 6 compares the top-three investments that financial advisors recommended to their customers and the top-three investments that financial advisors held in their own portfolios. This comparison helps to understand the conflict of interest between financial advisors and their customers. Insurance takes up the largest proportion of advisors’ portfolios, followed by mutual funds, stocks, certificates of deposit (CDs), foreign deposits, bonds, and others. Financial advisors also highly recommend insurance and mutual funds to their customers; however, following that, they then recommend foreign deposits and bonds instead of stocks and CDs as personal investments. These differences may reflect the pressure on advisors to meet the target quota or fees that they charge to customers. This article adopts AHP to analyze the weights of those factors that affect investors’ choice of WM services and the importance of WM services emphasized by financial advisors. The results are shown in Exhibits 7 and 8, respectively. From the full sample, products are the most influential factor in the selection of WM services, followed by quality of service and image. This result shows that investors are more concerned about the product itself than about good service or the high reputation of financial firms. Investors regard risk as the most important factor among the four subcriteria related to products, implying their concern over issues of uncertainty. Investors therefore are more likely to choose WM products that are safer even though the returns may not be as high as those of riskier alternatives. Among the four subcriteria related to quality of service, confidentiality is the most important, followed by attitude, communication, and convenience, in the order of their weights. It seems that investors are very concerned about security when selecting WM services. It is also worth noting that among the factors related to image, reliability is the most important, and popularity and recommendations are the least important. We next take subsamples characterized by several investor characteristics—gender, financial background, educational background, and investor attributes—that might affect the weights to analyze the data in more detail. The results indicate that the ranking of the criteria is quite robust and not affected by gender, investor attributes, having received a college/university degree or above, or whether the respondents have a financial background. The only difference found is for respondents who received a high-school degree or less; these investors took image to be more serious than products and quality of service. Among the subcriteria of products, most investors regard risk as the most important factor, except for investors with a financial background, investors who received a master’s degree or above, and active investors, who take returns more seriously than risk. Among the subcriteria of quality of service, male and active investors take attitude as the most important factor; female and moderate and conservative investors regard confidentiality as the most important. It is interesting to note that male and active investors are categorized in one group, whereas female, moderate, and conservative investors are categorized in the other group regarding the quality of service factor. Psychological research suggests that men are more overconfident than women in finance. 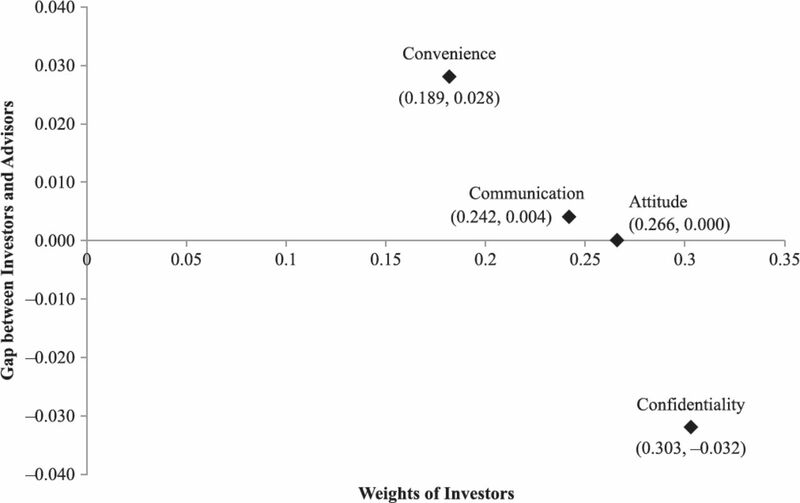 The behavioral finance literature also shows that men tend to be more active in making investment decisions and trade more excessively than women (Barber and Odean ). This article uses the same criteria and subcriteria used by Yu and Ting  so that it can compare the change in investors’ choice of WM service. Their questionnaires were collected between July and September 2008. When the survey was conducted four years later, the financial crisis had almost settled down, and the weights of those factors affecting investors’ choice may have changed. Yu and Ting  found that quality of service is the most influential factor in the selection of WM services, followed by products and image for the full sample, males, females, moderate and conservative investors, and investors with and without a financial background. Different from the previous results, this article finds that products are the most influential factor in the selection of WM services, followed by quality of service and image for the full sample and the same subsamples. In these two studies, the order of the weights is the same only for active investors—that is, products, followed by quality of service and image. It seems that investors are more likely to select a WM service that maintains a good relationship with them and provides them with good services, yet they then revert to emphasizing the product itself. Exhibit 8 shows that financial advisors most emphasize quality of service, followed by products and image for the full sample. 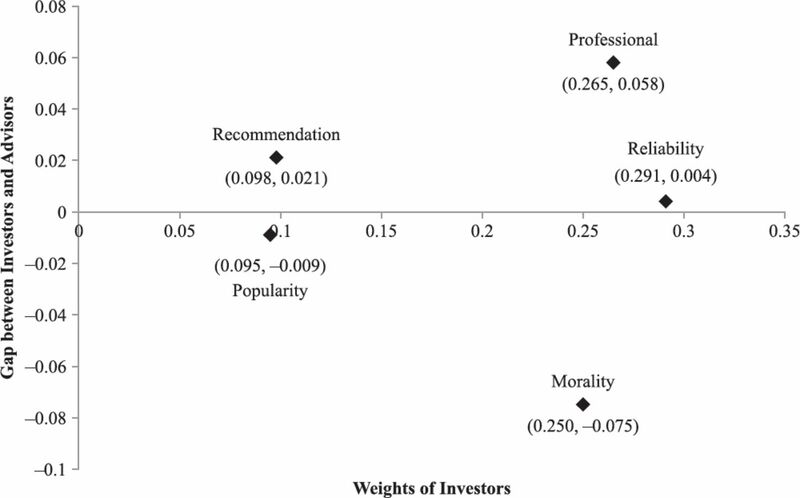 Financial advisors seem to follow investors’ past preferences as reported by Yu and Ting . However, investors now are concerned about the product itself instead of the good service or strong reputation of the financial firms. Only males and advisors who have received master’s degrees or above have caught investors’ concern and emphasized products the most. This difference suggests that financial firms should stress the importance of products’ ability to meet customers’ needs. For example, among the four subcriteria related to products, risk is the most important consideration from investors’ perspective, followed by returns, fees, and diversification, in the order of their weights. Financial firms should deliver their products based on customers’ risk tolerance and returns. Similar to investors’ concern, most advisors take confidentiality as the most important consideration under quality of service, except for advisors with 5 to 10 years of work experience, who regard attitude as the most important. For most advisors, risk seems to be the most important consideration under products. However, females and advisors with one to five years of work experience regard returns as the most important. Only advisors who received a high-school degree or less regard fees as the most important consideration, but not one investor feels the same way. Among the five subcriteria related to image, females and advisors who received a master’s degree or above—from most investors’ perspective found in Exhibit 7—regard reliability as the most important consideration. Most advisors, however, believe morality is the most important. Exhibits 9 to 12 compare the differences between the views of investors and advisors on WM services. 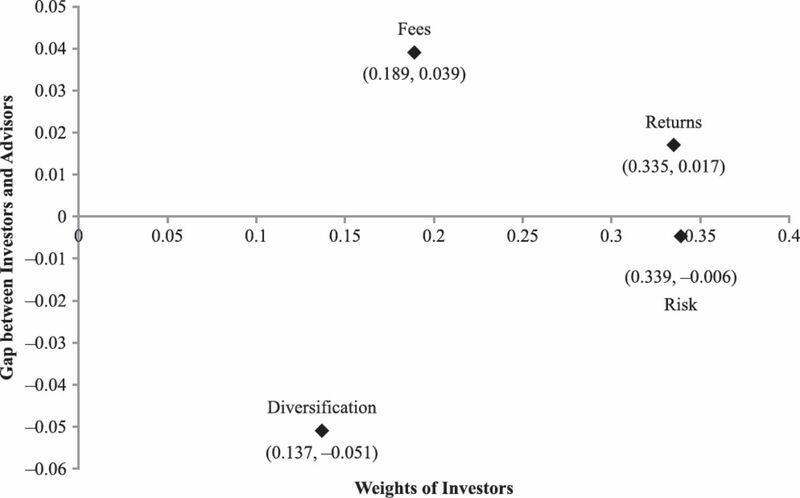 The x-axis shows the factor weights from the investor perspectives, and the y-axis shows the differences in factor weights from investors’ and advisors’ perspectives. The upper-right point presents the factor that investors regard as the most important when selecting WM services, but financial advisors do not emphasize this point as much as investors when providing WM services. Thus, financial advisors should stress the importance of this factor to meet investors’ needs. On the other hand, the lower-left point shows the opposite case. Financial advisors overemphasize the importance of this factor, whereas investors do not regard it as being particularly important. Among the three criteria, financial advisors should place more emphasis on product and less on quality of service. Exhibit 9 shows a 9.7% gap between investors and advisors on product and a −12.8% gap on quality of service. Among the subcriteria of image, financial advisors generally understand the top driver of customer retention to be reliability. Still, advisors should more strongly emphasize being professional, although the gap of 5.8% is relatively small. Among the subcriteria of products, financial advisors place less emphasis on diversification. Investors weight this factor the least, but financial advisors overemphasize it, leading to a −5.1% gap on diversification. Financial advisors generally meet most of the customers’ needs among the subcriteria of quality of service. Advisors emphasize confidentiality more than is required (a −3.2% gap); investors regard confidentiality as the most important factor when selecting WM services. This research collected questionnaires from both investors and financial advisors in 2012. From the former’s perspective on WM services, most believe WM services make them lose more money. Most investors do not agree that WM provides better quality of service, diversified products, image, professionalism, morality, and reliability after the financial crisis. This article also compares the top-three investments financial advisors recommend to their customers and the top-three investments financial advisors hold in their own portfolios. The difference between advisors’ recommendations and their own portfolios shows the conflict of interest between financial advisors and their customers. This article adopts the AHP method for ranking those factors that affect investors’ choice of WM services and the importance of WM services as emphasized by financial advisors. In 2008, investors were more likely to select a WM firm that maintains a good relationship with them and provides them with good services (Yu and Ting ). This article finds that investors instead emphasized financial products in 2012 because products are the most influential factor in the selection of WM services, followed by quality of service and image. Financial advisors, however, seem to follow investors’ past preferences, as found by Yu and Ting . Financial advisors emphasize quality of service the most, followed by products and image. This article presents important implications for financial firms that provide WM services. These firms should more greatly emphasize product rather than quality of service because there is a 9.7% gap on product and a −12.8% gap on quality of service between investors and financial advisors. Financial firms also should place more emphasis on professionalism under the category of image and less on diversification under the category of products. ↵ 1A bonus is a one-off gift given when opening or switching accounts. It could be a cash-back offer, music to download, a SIM card, an iPod, and so on. ↵ 2Incentives are available as long as the account is open and include mobile or car insurance, extra top-ups on mobile phones, discounts on travel or shopping, discounted international payments, and so on. ↵ 3The exchange rate is around NT$29.16 per US$1 during the sampling period (November 1 to December 31, 2012). NT$1 million is approximately US$34,295. “Integration of Analytic Hierarchy Process and Data Envelopment Analysis for Assessment and Optimization of Personnel Productivity in a Large Industrial Bank.” Expert Systems with Applications , Vol. 38, No. 5 (2011), pp. 5212-5225. “Boys Will Be Boys: Gender, Overconfidence and Common Stock Investment.” Quarterly Journal of Economics , Vol. 16, No. 1 (2001), pp. 261-292. “Customer Preferences for Financial Services: An Analysis.” International Journal of Bank Marketing , Vol. 12, No. 1 (1994), pp. 9-15. “A Fuzzy AHP and DEA Approach for Making Bank Loan Decisions for Small and Medium Enterprises in Taiwan.” Expert Systems with Applications , Vol. 37, No. 10 (2010), pp. 7189-7199. “Performance Evaluation with Fuzzy VIKOR and AHP Method Based on Customer Satisfaction in Turkish Banking Sector.” Kybernetes , Vol. 42, No. 7 (2013), pp. 1072-1085. “Islamic Banking: A Study in Singapore.” International Journal of Bank Marketing , Vol. 15, No. 6 (1997), pp. 204-216. Managing Commercial Banks . Englewood Cliffs, NJ: Prentice-Hall, 1990. “The Impact of 3D e-Readiness on e-Banking Development in Iran: A Fuzzy AHP Analysis.” Expert Systems with Applications , Vol. 37, No. 6 (2010), pp. 4084-4093. “Customer-Oriented Financial Service Personalization.” Industrial Management and Data Systems , Vol. 105, No. 1-2 (2005), pp. 26-44. “Calibrated Fuzzy AHP for Current Bank Account Selection.” Expert Systems with Applications , Vol. 40, No. 9 (2013), pp. 3775-3783. “Bank and Product Selection: Hong Kong.” International Journal of Bank Marketing , Vol. 10, No. 1 (1992), pp. 3-16. “How Customers Choose Banks.” Journal of Retail Banking , Vol. 14, No. 4 (1992), pp. 41-44. “The Behavioural Sequence of the Financial Services Industry in Taiwan: Service Quality, Relationship Quality and Behavioural Loyalty.” Service Industries Journal , Vol. 26, No. 2 (2006), pp. 119-145. “Establishing an Evaluation Model for Emerging Industry Credit Ability for the Banking Sector.” Journal of Testing and Evaluation , Vol. 38, No. 3 (2010), pp. 271-276. “Consumer Choice Criteria in Retail Bank Selection.” International Journal of Bank Marketing , Vol. 3, No. 2 (1985), pp. 64-74. “Application of Fuzzy MCDM Techniques in Evaluation and Ranking of Bank Branches Based on Customer Satisfaction Case Study: Bank Branches of Mellat in Qazvin Province.” Life Science Journal-Acta Zhengzhou University Overseas Edition , Vol. 9, No. 4 (2012), pp. 3315-3321. “Impact Analysis of Logistics Facility Relocation Using the Analytic Hierarchy Process (AHP).” International Transactions in Operational Research , Vol. 20, No. 3 (2013), pp. 325-339. “A Scaling Method for Priorities in Hierarchical Structures.” Journal of Mathematical Psychology , Vol. 15, No. 3 (1977), pp. 234-281. The Analytic Hierarchy Process: Planning, Priority Setting, Resource Allocation . New York: McGraw-Hill, 1980. Models, Methods, Concepts and Applications of the Analytic Hierarchy Process , 2nd ed. New York: Springer, 2012. “Organisational Critical Success Factors in Adoption of e-Banking at the Woolwich Bank.” International Journal of Information Management , Vol. 26, No. 6 (2006), pp. 442-456. “How Customers Perceive Service Quality.” Journal of Retail Banking , Vol. 16, No. 2 (1994), pp. 29-37. “The Evaluation of Bank Performance Using a Multicriteria Decision Making Model: A Case Study on Lithuanian Commercial Banks.” Technological and Economic Development of Economy , Vol. 18, No. 1 (2012), pp. 189-205. “Intention, Attitude and Social Influence in Bank Selection: A Study in an Oriental Culture.” International Journal of Bank Marketing , Vol. 43, No. 3 (1986), pp. 43-54. “Analytic Hierarchy Process: An Overview of Applications.” European Journal of Operational Research , Vol. 169, No. 1 (2006), pp. 1-29. “Applying the Consistent Fuzzy Preference Relations to Select Merger Strategy for Commercial Banks in New Financial Environments.” Expert Systems with Applications , Vol. 36, No. 3 (2009a), pp. 7019-7026. “Using a Multi-Criteria Group Decision Making Approach to Select Merged Strategies for Commercial Banks.” Group Decision and Negotiation , Vol. 18, No. 6 (2009b), pp. 519-536. “Evaluating Business Performance of Wealth Management Banks.” European Journal of Operational Research , Vol. 207, No. 2 (2010), pp. 971-979. “Financial Service Sector Performance Measurement Model: AHP Sensitivity Analysis and Balanced Scorecard Approach.” Service Industries Journal , Vol. 31, No. 5 (2011), pp. 695-711. “Customer Perception, Customer Satisfaction, and Customer Loyalty within Chinese Securities Business: Towards a Mediation Model for Predicting Customer Behavior.” Journal of Relationship Marketing , Vol. 5, No. 4 (2006), pp. 79-104. “Identifying Key Factors Affecting Consumers’ Choice of Wealth Management Services: An AHP Approach.” Service Industries Journal , Vol. 31, No. 6 (2011), pp. 929-939. “The Analytic Hierarchy Process. A Survey of the Method and Its Applications.” Interfaces , Vol. 16, No. 4 (1986), pp. 96-108. “Bank Strategic Positioning and Some Determinants of Bank Selection.” International Journal of Bank Marketing , Vol. 14, No. 6 (1996), pp. 12-22.